The holidays may be the only time that you have a lot of people over for dinner. Other days, you might sit at a small table big enough for two, or you might just take your plate to the couch and eat while you watch something on the television. You don’t really have a reason to have a big table, and you may not have the room. You don’t want to take up a lot of space with a large dining table that you rarely use, and you may prefer to use the space for something else, like a home office. The Junior Giant Table truly encompasses its name. In its base state, it is a simple table that’s just big enough for one person or two. You can use it as a personal dining table for your daily meals, or you can use it as a small desk. It’s the perfect size for a laptop and a few essentials. The table can then be pulled out to become an 8-seat dining table. Just grab both sides of the table and pull them apart to extend the table. A framework will be revealed on which you can put the eaves to create the larger table top. The space-saving kitchen table is extendable to different positions, allowing you to seat only the people you need to seat without taking up more room. 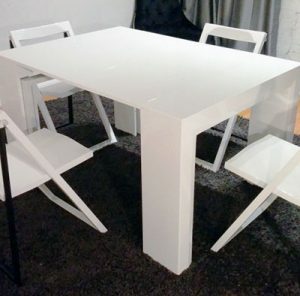 When the table is fully extended, it can comfortably seat eight people. If you want to pack the table, you can seat up to 10. The table gives you the functionality you need to eat your daily meals and accommodate guests when they are over for the holidays or a weekend dinner party. You don’t have to take up space with a formal dining table that isn’t being used all the time. This table set features the popular Junior Giant Table with eight attractive chairs. You get all the functionality for which the Junior Giant Table is known, and you get eight space-saving chairs to seat guests when the table is fully extended. The chairs fold up for easy storage when they are not in use. You can stack the unused chairs in a closet and retrieve only the chairs you need when guests call. These aren’t your standard folding chairs – they are sleek and stylish. These chairs will look just as good for a formal dinner party with your boss as they will for a casual weekend lunch with your family. Get the set to ensure you have everything you need for entertaining guests or everyday dining. The Tiny Titan Transforming Kitchen Table looks more like a traditional desk when it is in its base configuration. It is a simple table top that can be used as a computer desk or as a kitchen table big enough to seat four. However, it transforms to seat as many as 10 to 14 people. It is one of the largest extending dining room tables that Expand Furniture carries, and it is one of the most beautiful. It comes in multiple finishes, including glossy white, aged light ash, aged light walnut, and walnut wood. You can create the perfect look for your dining room when you are ready to host a large holiday dinner. 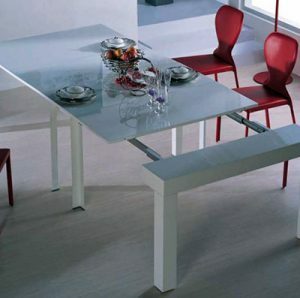 Expand Furniture has numerous space-saving kitchen table options to suit your personal style. 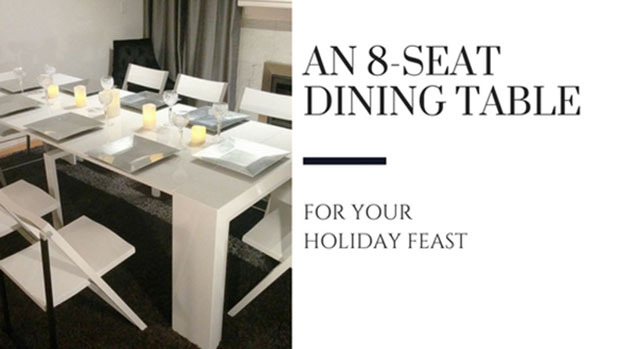 You can use the tables as desks, small dining tables, entry tables and more, and you can expand them to host your holiday dinner or other special event. Check out our catalog to find an 8-seat dining table or other extending dining room table. We also offer other space-saving furniture options, such as modular shelving systems, Murphy wall beds, chairs and more. We have options for every room in your home, contact us today!